I cannot even begin to mention how many times this subject has been brought to my lips. It's always evolution or creation--which is it? First I want to explain myself, I am a born-again Christian. I do believe there is a supreme being we call "GOD". I also believe in Nature. Those that choose to follow the specifics of an organized religion I feel are free to do so. I don't have a specific religion, so to speak. I created one of my own. I may never have any followers, but that is fine by me! I have never been the "follow-the-leader" type so creating my own religion is typical of my regular personality. I don't go to church because there is none to support my style or beliefs. However, I do believe in GOD. I've felt HIS presence too many times not to believe in HIM. HE always answers my prayers, and my meeting with Tim Farriss in Seattle is definite proof of that!!! That plus several little miracles that go on all around me every day. I also believe in Jesus and how he died for our sins. The only thing that is mentioned in the Bible that I cannot believe is the theory of creation. OK, so it says GOD created the Heavens and the Earth in a period of 7 days. Many creationists believe that each one of GOD's days consists of 10,000 years. That is still too little time!!! The Earth is proven to be MUCH more than 70,000 years old!! However, if one of GOD's days were to consist of 1 billion years, I would believe that! The Earth has been proven to be about 6 billion years old now. Maybe in the future, it will be proven to be 7 billion years old. THAT would make the theory of creation a bit more believable. Many new creations in the world are being discovered, including a new island that just popped up in the south Pacific just last year. It's cool!! It is feasible that the land masses were created in a relatively short time, but they take many many years to drift apart. The continents move at about the same rate as our fingernails grow, about an inch a year. That alone should tell all how very old the land masses of this world really are, and it'd have to be a lot more than 70,000 years. And all creationists want to believe that is how old the world is and there is no swaying them. 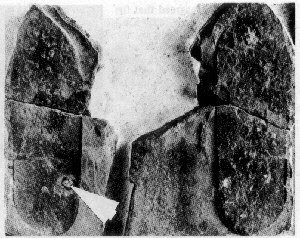 There is also an article that discusses these footprints found in Utah. Here is the link: http://www.pureinsight.org/node/938 even they cannot really explain this formation. Apparently in that same rock, a couple more tracks were found with sandals on, and even the barefooted tracks of small children, all with trilobites. Apparently 600 million years ago a family of rather large humanoids were enjoying a day at the beach! Much like we would today. Personally, I believe this article: http://paleo.cc/paluxy/meister.htm. It also has better photographs. Maybe those are natural geological formations. Though exactly what I don't know. I just know that there were no humans 600 million years ago. If there had been, like this one other article said, there would be too many humans now for the Earth to accommodate, especially with our rate of reproduction!!! When someone can show me real proof that there are human bones, giant ground sloth bones, mammoth bones AND dinosaur bones all buried in the same rock, I will then take back my beliefs that dinosaurs and large mammals were not all around at the same time, thus my evolutionary beliefs. But to date, I have not seen any analytical proof that dinosaurs lived side-by-side with mammoths, sabre-toothed cats or giant ground sloths, and certainly not with humans!! Evolution is even going on today right under our noses. I have seen good evidence of this. I tell you, it's going to take a lot to convince me that creation is the only way every living thing got here. I just cannot believe that humans just suddenly appeared without warning on a hilltop somewhere. Though exactly how we got to where we are today I have no idea. I once heard that it is impossible that humans, in our present form, could not have evolved from neanderthals. Maybe it was society that softened our features. I don't know what the future of the human race is going to be like. We are getting fatter, I can tell you that. Maybe we are slowly evolving into a larger species? Maybe we will become like elephants in our next evolutionary spurt. Who knows?